c1907. Junior Monarch. Exhibit at the National Museum of Scotland in Edinburgh. c1908. Bijou Grand. Exhibit at the National Museum of Scotland in Edinburgh. c1910. Senior Monarch. Exhibit at the National Museum of Scotland in Edinburgh. March 1960. 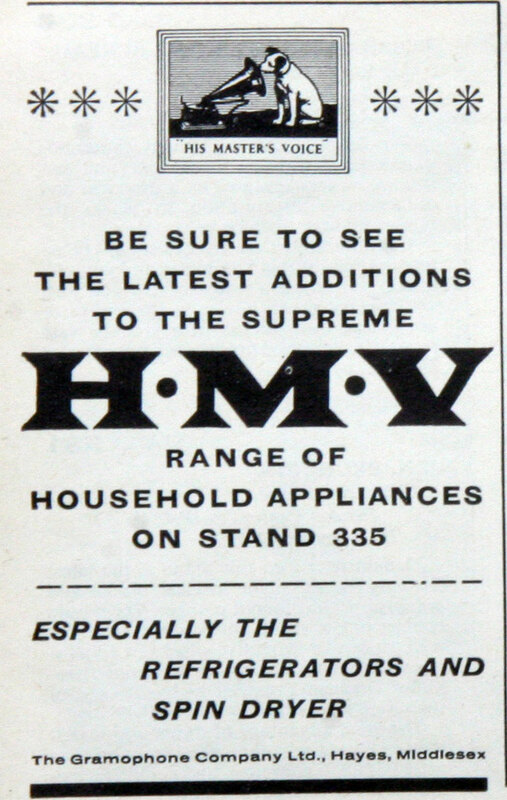 HMV Domestic Appliances. 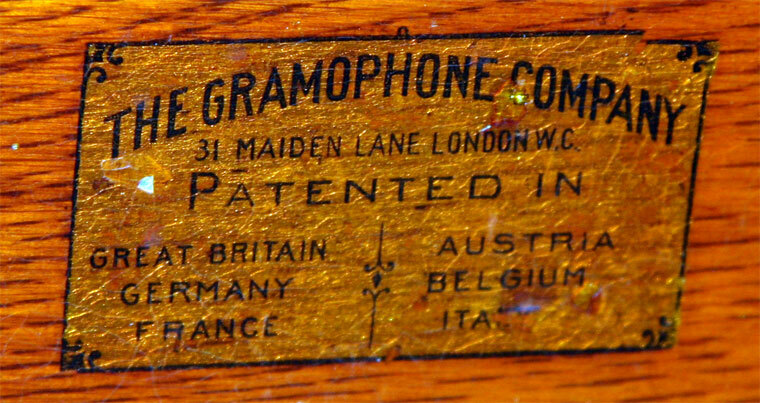 1897 The UK Gramophone Co was founded by William Barry Owen and his partner/investor Edmund Trevor Lloyd Williams, as the UK partner of Emile Berliner's United States based United States Gramophone Company, which had been founded in 1892. 1890s An icon of the company was to become very well known - the picture of a dog listening to an early gramophone painted in England by Francis Barraud. 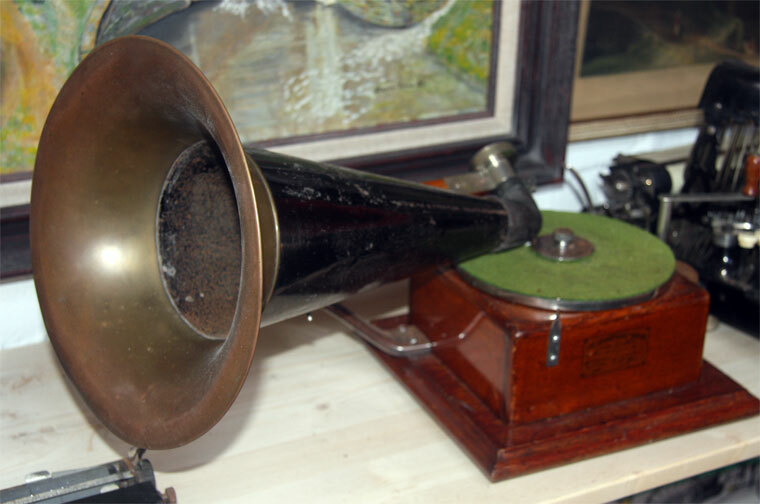 The painting "His Master's Voice" was made in the 1890's with the dog listening to an Edison cylinder Phonograph, which was capable of recording as well as playing, but Thomas Edison did not buy the painting. 1899 Owen bought the painting from the artist, and asked him to paint over the Edison machine with a Gramophone, which he did. Technically, since Gramophones did not record, the new version of the painting makes no sense, as the dog would not have been able to listen to his master's voice (the master being Barraud, and his own Nipper the dog). Gramophone's talking machine manufacturer, Eldridge R. Johnson, was left with a large factory, thousands of talking machines and no records to play on them. He filed suit in 1900 to be permitted to make records himself. He won, in spite of the negative verdict against Berliner. This victory by Johnson, used to name the new record company the Victor Talking Machine Company he would found in 1901, may have been partly due to a patent-pooling handshake agreement with Columbia that allowed the latter to begin producing flat records themselves, which they began doing in 1901, (all Columbia records had previously been cylinders). Contrary to some sources, the Victor Talking Machine Company was never a branch or subsidiary of Gramophone, as Johnson's manufactory, which had been making talking machines for Berliner, was his own company with many mechanical patents that he owned, which patents were valuable in the patent pool agreement with Columbia. Thus, Victor and Columbia began making flat records in America, with UK Gramophone and others continuing to do so outside America, leaving Edison as the only major player in the making of cylinders (Columbia still made a limited number for a few years), and Emile Berliner, the inventor of flat records, out of the business. All he was left with were the master recordings of his earlier records, which he took to Canada and reformed his Berliner label in Montreal, Nipper logo and all. Edison would soon join the flat record market with his diamond discs and their players. 1902 Eldridge Johnson of Victor Talking Machine Company acquired US rights to use the dog and gramophone as the Victor trademark, which began appearing on Victor records that year. UK rights to the logo were reserved by Gramophone. Nipper lived from 1884 to 1895 and is buried in England with a celebrated grave marker. 1908 In February, the company introduced new labels featuring the famous trademark known as "His Master's Voice," generally referred to as HMV, to distinguish them from earlier labels which featured an outline of the Recording Angel trademark. The latter had been designed by Theodore Birnbaum, an executive of the Gramophone Company pressing plant in Hanover, Germany. 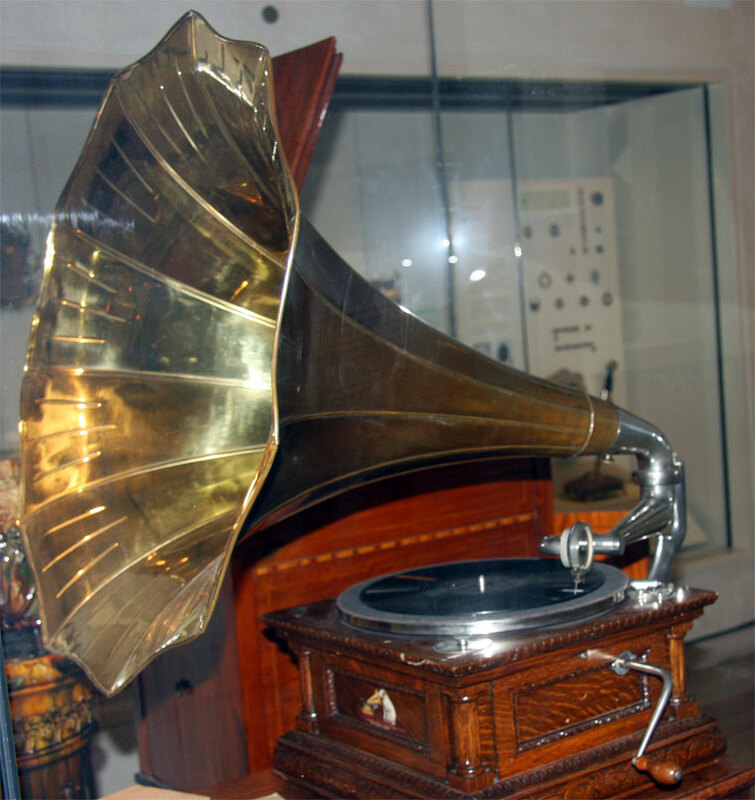 The Gramophone Co was never known as the HMV or His Master's Voice company. 1910 By the time the company's now familiar trademarks were registered, they had opened built and opened a recording studio in Hayes, Middlesex. 1921 A new shop was opened by the company in Oxford Street, London. 1929 Acquired Marconiphone Co as well as Marconi's share in M-O Valve.. Started manufacture and sale of His Master's Voice domestic radio sets. 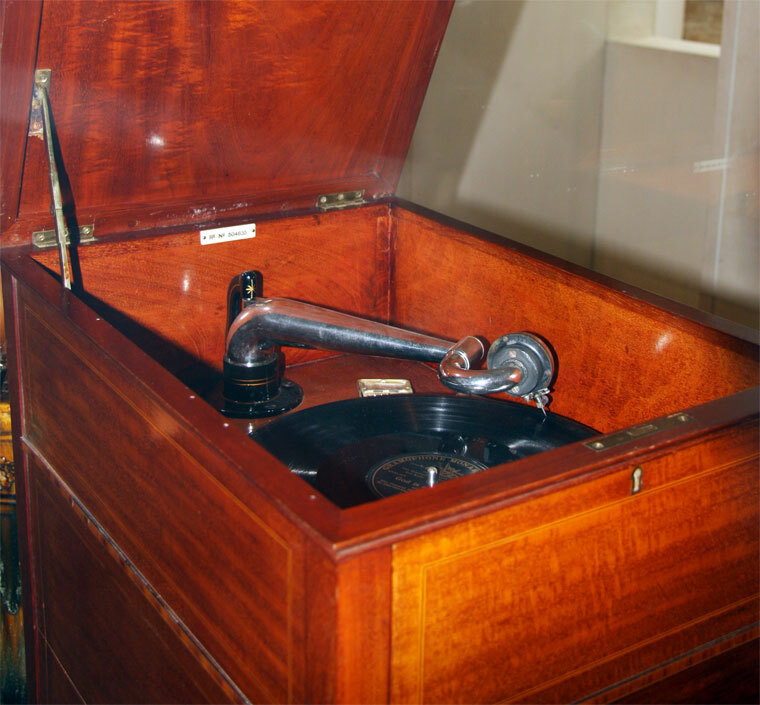 1931 In March, the Gramophone Co merged with Columbia Graphophone Co to form Electric and Musical Industries Ltd (EMI). The Gramophone Company, Ltd name, however, continued to be used for many decades, especially for copyright notices on records. The Abbey Road Studios in London were opened. 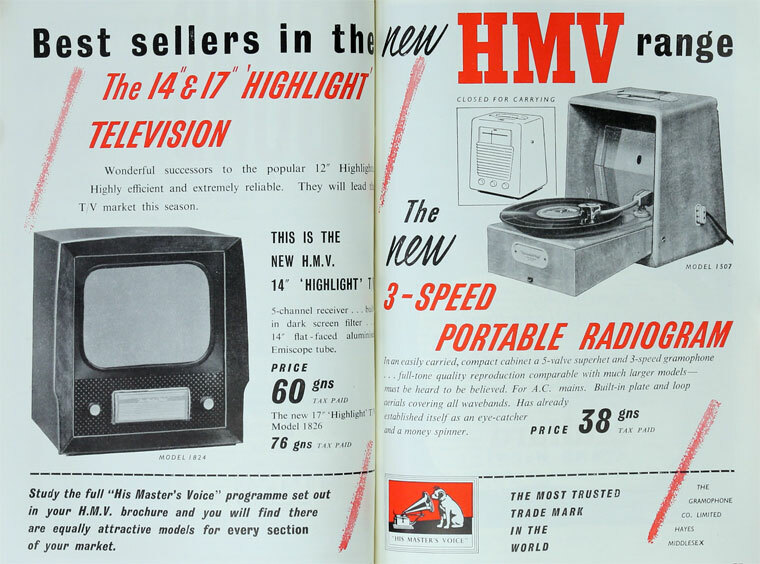 1945 With Smiths Motor Accessories Ltd formed joint company Radiomobile Ltd to market car radios developed and manufactured by the Gramophone Co.
1946 As result of reorganisation of EMI, the Gramophone Co's research, design and production activities were distributed between 3 of EMI's subsidiaries. 1979 EMI was acquired by Thorn Electrical Industries to form Thorn EMI. 1996 EMI demerged from Thorn EMI. 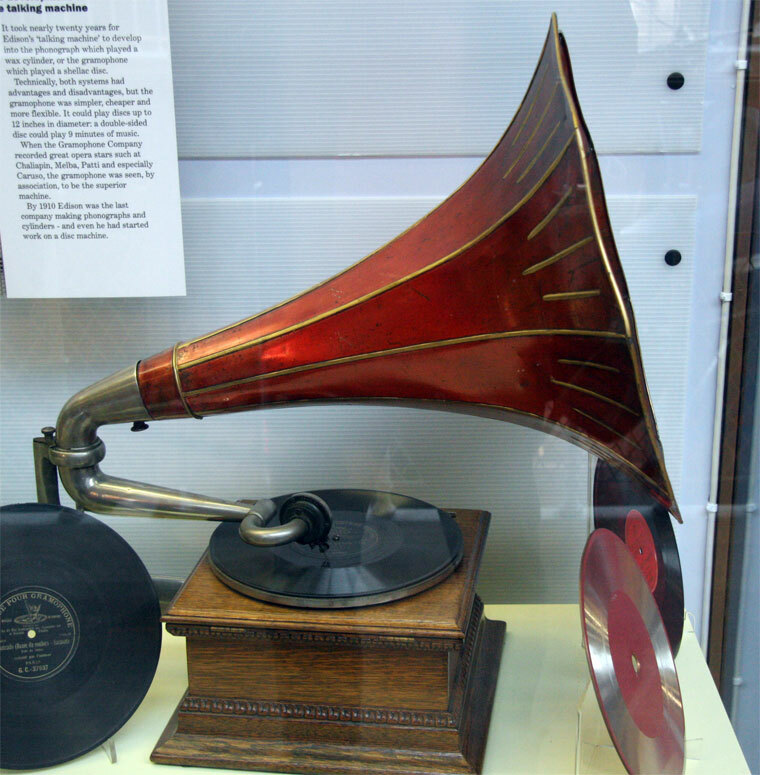 2008 The His Master's Voice and Nipper trademarks are still used today by HMV in Britain. This page was last edited on 27 October 2017, at 17:11.